A comedy is, in modern times, a drama which has a generally funny content and in general a happy ending. This definition is used for theatre plays, and was first used in Ancient Greece. The word comedy is also used for television shows or movies that are funny, silly or that make people laugh. Comedies may also show people telling jokes and funny stories. People who are known for acting in comedies are comedians or comedic actors. The ancient Greeks had comedies, which were presented in competitions at the festival of Dionysia. One of the best-known comedy authors of the time was Aristophanes (about 446–386 BC). One of his works, The Clouds was performed 425 BC. The work did not survive completely, but a later version did survive. It is a satire against Socrates, and pictures the great philosopher as a swaggering con artist. Some of the accusations were re-used at Socrates' trial, twenty years later. Typical for satire are that the author criticizes society, and living people. Another type of Ancient Greek theatre was the satyr play. The modern equivalent would be knock-about comedy. Humour, or 'New Comedy' is not about criticizing people or ideas, but rather about showing characters in funny situations. The most important Greek playwright of this type was probably Menander. The best known Roman comedy writer was Plautus. He often used Greek comedies for his plays. Many comedy plays were written in the 1500s by the British writer William Shakespeare. Shakespeare's comedy plays include: All’s Well That Ends Well, The Comedy of Errors, A Midsummer Nights Dream, and Twelfth Night. In Shakespeare's day a comedy did not mean a play that would make people laugh or that had a lot of jokes. Instead it was a play in which all the problems work out all right in the end. This was unlike a tragedy, where the problems do not work out, usually resulting in someone's death. The two masks, one was smiling, the other crying, often associated with theatre represent comedy and tragedy. There are different types of comedy. One type of comedy is called "slap stick comedy." In "slap stick comedy," people do silly things such as tripping, falling over or embarrassing themselves just to make people laugh. Slap stick comedy can be used in comedy movies or comedy television shows. Slap stick comedy was used a lot in silent (no sound) movies from the 1920s. 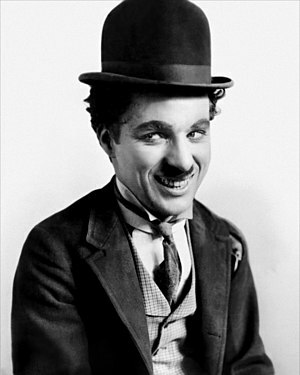 A comedian who acted in the silent movies who used a lot of slapstick comedy was Charlie Chaplin. In the 1950s and 1960s, comedian Jerry Lewis also used silly slap stick comedy in his comedy movies. A comedy is a very popular type of movie. Some comedy movies have "slapstick comedy," in which people just do silly things such as tripping, falling over or embarrassing themselves just to make people laugh. Other comedy movies show funny stories or situations in which people are behaving in a silly manner. Some comedies make the audience laugh by showing strange or unusual images or situations that do not make sense. Some types of comedy movies mix comedy with other types of movies. There is a type of movie called a dramedy, which is a mix of a drama movie and a comedy movie. There is also a type of movie called a romantic comedy (sometimes called a "rom-com"). In romantic comedies, there is a love story about a couple who fall in love, along with silly or funny comedy parts. Comedy shows are very popular on television. Comedy shows on television are often called "sitcoms." The word "sitcom" is a shortened way of saying "situational comedy." Television situational comedies usually show characters who do silly or funny things which make the audience laugh. This page was last changed on 13 December 2014, at 21:00.